^ Pratt, Keith; Rutt, Richard. Korea: A Historical and Cultural Dictionary. Surrey: Curzon Press. 1999: 194. ISBN 978-0-7007-0464-4. ^ Nahm, Andrew. “The impact of the Taft-Katsura Memorandum on Korea: A reassessment” Korea Journal October 1985, 9. ^ Nahm, Andrew. “The impact of the Taft-Katsura Memorandum on Korea: A reassessment” Korea Journal October 1985, 10. 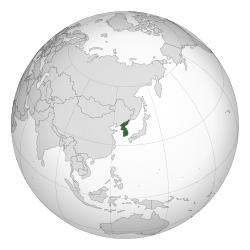 ^ Kim, Ki-Seok, “Emperor Gwangmu’s Diplomatic Struggles to Protect His Sovereignty before and after 1905” Korea Journal summer (2006) 239. ^ Kim, Ki-Seok, “Emperor Gwangmu’s Diplomatic Struggles to Protect His Sovereignty before and after 1905” Korea Journal summer (2006) 240. ^ Kim, Ki-Seok, “Emperor Gwangmu’s Diplomatic Struggles to Protect His Sovereignty before and after 1905” Korea Journal summer (2006) 245.